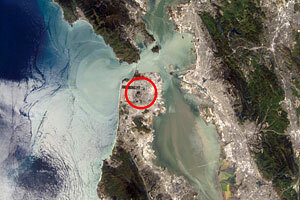 The Large Hadron Collider, if located in the Bay Area, would encompass a sizable piece of San Francisco. Image Credit: NASA.In about one month the world’s biggest science experiment, the Large Hadron Collider (LHC) at CERN in Geneva, Switzerland, will once again fire up. So now may be a good time to stop and remember what a stunning and ambitious project this is. Indeed, it becomes hard not to get lost in such an endless list of superlatives once you start noticing. I have gleaned a few below. See CERN’s website for more, or Jennifer Skene’s blog for a great set of LHC links. She’s Electric: To power a standard light bulb you need 60 Watts (or 15 watts for an equivalent CFL). To power a small house you need an average of about a thousand watts. To run the LHC at full power researchers will need 120 million watts. Alternatively, you could run the LHC, supply electricity to a population the size of Berkeley, or simultaneously bake 60,000 Thanksgiving turkeys. You could only fly three 747 airplanes, though. Life in the Fast Lane: A fundamental axiom of physics states that no information can travel faster than the speed of light. The LHC’s proton beams are no exception, but their speeds do approach light speed to within a fraction of a millionth of 1 percent. Such velocities defy comprehension. Suffice it to say that if we ever managed to accelerate a person to this velocity, time would warp so much that we could expect her to live for half a million years. The Long and Winding Road: The LHC’s 17-mile circumference could make it a nice racetrack for a half-marathon, but don’t try racing the beam. When operational, protons will shoot around the LHC more than 11,000 times per second. Even more mind-boggling is the length of wire used in the construction of the LHC’s thousands of superconducting magnets. CERN claims there is enough wire wrapped up in these magnets to trace out more than six trips to the Sun and back. OK Computer: When operational, the LHC is expected to generate 15 petabytes of data and simulations per year, which amounts to the hard drive space of about 30,000 high-end personal computers. At CERN in 1989, Tim Berners-Lee and Robert Cailliau revolutionized the world with their development of key pieces in the framework of the World Wide Web. The networks being developed to manage the LHC’s expected data have inspired talk of a similar revolution to come. A Whole New World? : All of these wonders of physics and engineering have been developed for the purpose of one thing: to create a particle smasher with the capability of knocking two protons together with an energy of 14 TeV (trillions of electron volts). This is about the same energy that it takes to pick a grain of salt up off the floor. Compressed into such an acute space, however, it just might lend us insight into the most fundamental properties of our universe. Congress cut off funding for the SuperCollider which was located in Ennis, Texas. Now the facility sits idle.